Lest you think we ate nothing but savory foods at our Christmas celebration, let me show you all the sweet, sugary delights we consumed. Technically these aren’t all of them, because I didn’t photograph the oodles of beautiful and undoubtedly delicious non-vegan desserts my aunt shared. But I don’t think you’ll miss them when you see all the sweets we shared! Look at the perfectly clean slices! And check out how lovely they look, all nestled up to one another pre-baking. And the finished product, covered in an oozy, sweet icing, is equally appealing. As usual, I could barely finish one of these buns with breakfast – I had to save the rest for later, when I needed some post-present-opening refueling. 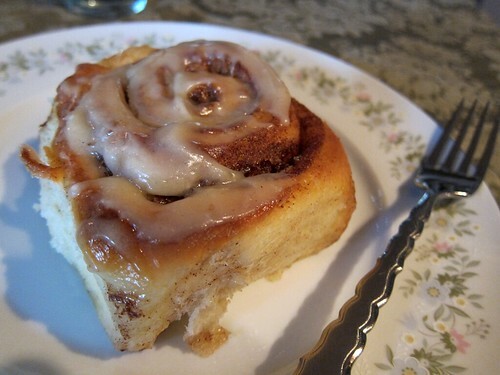 Rest assured, cinnamon buns weren’t the extend of our sweet treats. 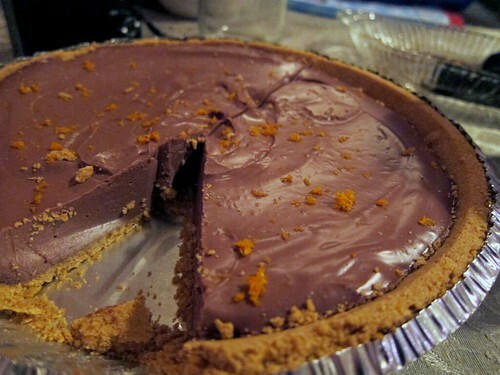 For dessert proper, Mum made an amazing chocolate-orange mousse pie, a rich, creamy confection with the perfect blend of chocolate and citrus. I would like to eat a slice right now. Even though I didn’t make this pie, I think I contributed to its deliciousness by cluing my mom in to silken tofu – apparently, the last time she made it she used regular soft tofu. 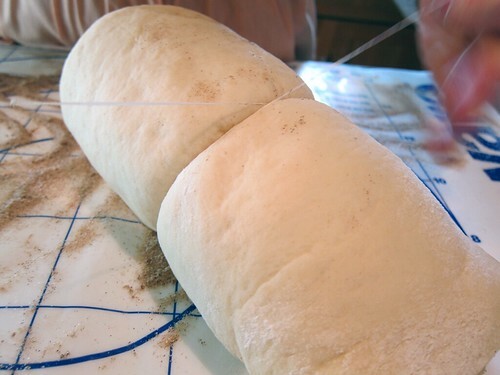 This time around, I set her straight, to marvelously smooth and creamy results. Although I can’t claim the pie as my own creation, I did contribute my fair share to the dessert table. Because Christmas isn’t Christmas without cookies, I whipped up some Five-Spice Snaps from Hannah Kaminsky’s Vegan Desserts: Sumptuous Sweets for Every Season and some Peppermint Mocha Roll Cookies from Scissors and Spice. Both of these cookies were excellent. The snaps were just a touch more sophisticated than your typical gingersnap, with a mellower yet more nuanced flavor. 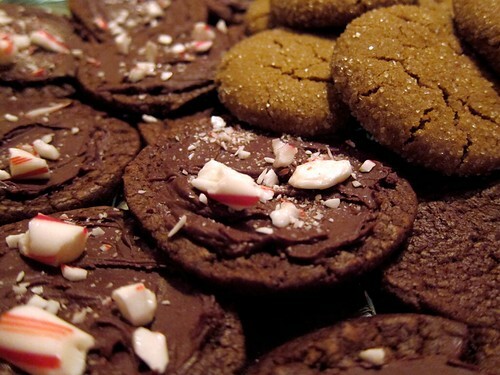 And the peppermint mocha roll cookies were the perfect yuletide delicacy, chocolaty and minty with a tiny kick of caffeine and just the right amount of chewiness. I also made a sort of gingerbread cake, but it came out a little dry and not terribly gingerbread-y. 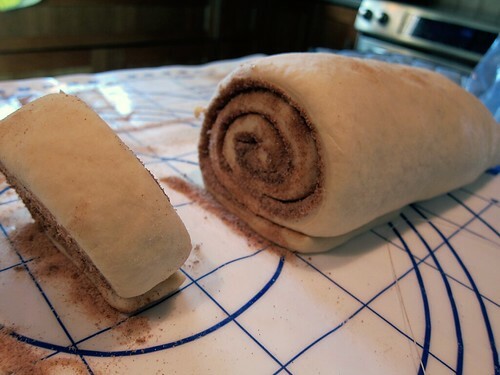 I totally forgot to photograph it, but no matter – it was pretty forgettable; I don’t even recall where I found the recipe. 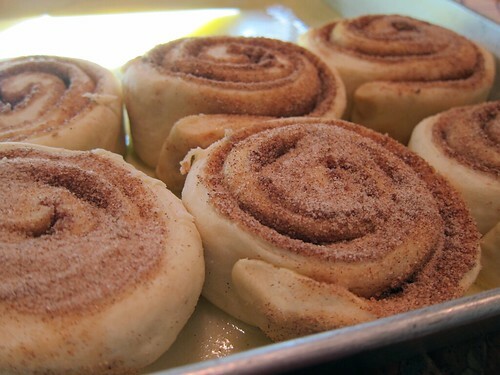 Oh goodness me, those cinnamon buns look divine.